elle le fantôme, moniker of Brooklyn-based artist Tyler Elizabeth, is one of the most interesting contemporary synthpop artist in the world. This autor of “miniature symphonies for rainy days”, as described by the website Brooklyn Vegan, dresses her songs with raw rythms and ferocious synths, serving personal lyrics that tell intimate stories but doesn’t fall into sentimentality clichés. After publishing paint it blacker, her first album, on the Nashville based label Outside The Circle, Spanish label Mondo Canapé wanted to rescue her first two EPs, yellow fevers and blue dreams, and give them a deserved physical release. 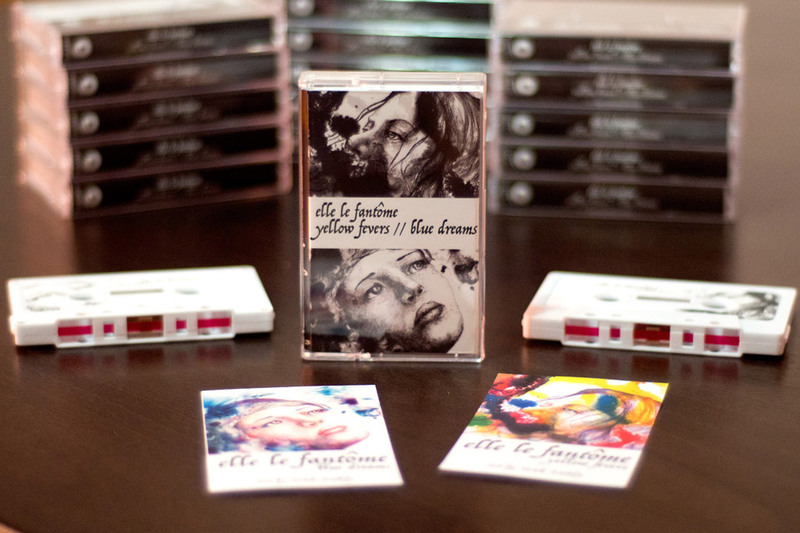 In this carefully curated limited edition cassette edition, are collected these six first recordings by elle le fantôme, previously available in digital format only. This edition includes color reproductions of the wonderful art of the original covers by Nick Fadely. You can now listen now to yellow fevers // blue dreams in the Mondo Canapé Bandcamp page, where the limited edition cassette is also available for purchase.